The Instaframe Pro app for iPhone helps you create customized photo collages. 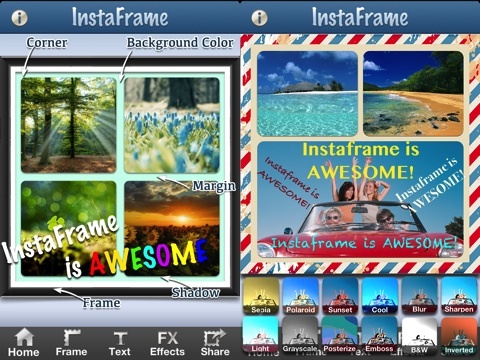 If you thrive on highly detailed iOS photography apps, then you’ll love the collages produced by Instaframe Pro. The choices available to create your Instaframe Pro customized photo collages will blow you away. For $.99, you can select from 30 themes, and each theme has 54 collage arrangements. You scroll through all of the arrangements and themes using finger swipes. Once you make a selection, you are transported to a screen with a navigation bar at the bottom to add your photos, effects, frames, and text. You move quickly back and forth between the selections with a touch. You tap the photo shape on the collage, and your iPhone photo libraries appear. You select a photo, and then you may choose from a dozen photo effects. The Instaframe Pro iOS app effects range from sepia and black and white to bold pop art inspired vibes. You may also choose to add effects to individual photos by double tapping each photo, so the entire collage does not have to be the same effect. The frame adjustment allows you to change the size of the areas between the photos and adjust the color of the interior frame. The frame adjustment tools are very thorough and precise. You can increase and decrease the size of the outside frame and interior areas separately with gesture controls similar to a volume adjustment on a YouTube video. You can also adjust the color of the interior frame by moving your finger along a box of color arranged in rainbow. Once you have selected the color area, a vertical column of color allows you to select an intensity of color as well. The photo collage’s caption has similar navigation and customization features to the frame adjustment. You add text, then move it on the screen to place it. You change the size of the font with a volume-style gesture control. The color of the font is also chosen with a similar interface to the interior frame color. You change font style by touching the font icon. A dial of options appears, and you touch your selection to add it to the photo collage. Once you have completed your Instaframe Pro photo collage, you can share with one touch to Instagram, Twitter, Facebook, Flickr, and email. You may also choose to save to your photo album as well. There is a free version of the Instaframe iOS app with limited choices. However, the small investment of $.99 for the Instaframe Pro iOS photography app packs tons of customization tools and functions into a neat package. 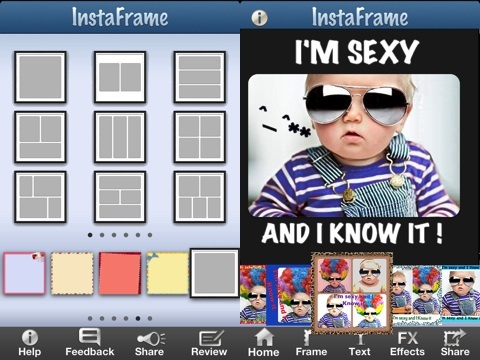 AppSafari review of Instaframe Pro – Photo Frame & Photo Captions for Instagram was written by Jenni Ward on June 29th, 2012 and categorized under App Store, Photos, Social, Video. Page viewed 5436 times, 1 so far today. Need help on using these apps? Please read the Help Page.